Love stories are so often over-simplified into a short and sweet narrative. A montage of marvelous moments that end in happily ever after. That’s not what love is though. Relationships are a portrait of love that can’t be painted within the lines. The reality behind relationships stretches miles further than the highlight reel of Instagram. Those snippets can feel like flashes of light while exploring the dark side of the moon. Only the two of you are there together to feel around and find the way. 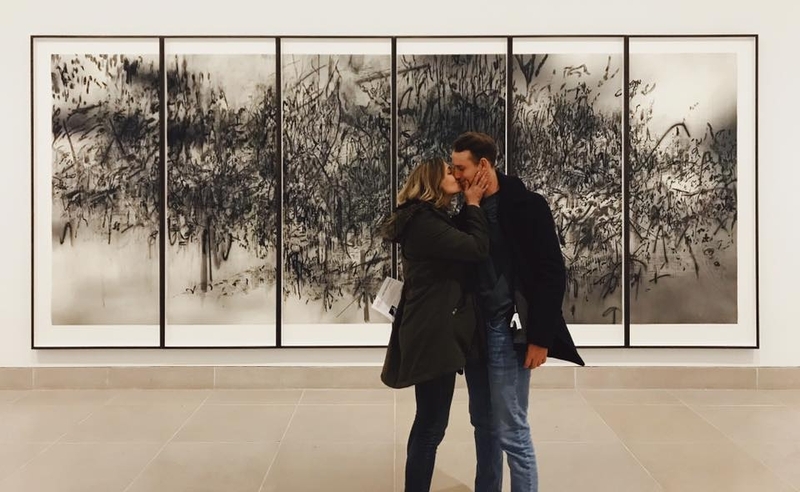 The funny thing is no matter how well-versed you are in the language of love, every trip with each partner can feel fulfilling, frightening and foreign all at the same time. There’s something so damaging in only displaying the happy moments - in tucking away our troubles for fear of outsiders' passing judgment. The irony here is that we've all felt this way. As humans, we often hide the hard moments of love, the sticky moments of love, the learning moments of love. What's weird about this is that we experience acceptable highs and lows in every other aspect of our lives - why should love be an exception? What those montages miss are the undocumented moments. The mundanities of a day passed without a flicker of thought to step foot outside of the apartment. Waking up with a serious case of Monday moodiness, pawing at their waist and putting a damper on their day because you selfishly want someone else to sulk with. Dragging them to pick up a piece of furniture, waiting an hour for the warehouse workers to actually get said furniture and catching a serious attitude as you grow hangrier and hangrier. These are the real moments that don’t make the cut for the reel. But it’s also about catching a glimmer of beauty in the moments when one of you is peeing and the other is a foot away brushing their teeth. It’s saying “I love you” so many times that you feel like it must eventually lose its luster. How could three words possibly explain the tenderness in which another person has touched your soul? How could three words represent the hundreds of hours you’ve spent peeling back your layers, showing them corners of your mind that even you didn’t know existed? Complexity is what constructs the realness of relationships. When you choose someone, you don't get to sort through and pick only the happy moments and leave the hard ones behind. When it comes to capturing the depth of love with words or stories or memories, it can feel impossible. So I'll leave it at this – it’s the feeling of calling another person your home. It's the feeling of not wanting to even look at someone, while simultaneously wanting nothing more than to fall asleep drooling by their side. Soak in the moments of struggle. Remind yourself that these moments are the reality behind relationships. Rather than sprinting for the exit, stop and sit in the foreign feelings. Ask yourself where these emotions are rooted. Talk to someone without fearing it will change the way they view your relationship - chances are, they’ve experienced something similar. Be honest with yourself and your partner - even if you have to cry it out. Take time for yourself. It’s a wonder what a dose of cultivating your own secret garden can do for your relationship. People frequently paint this picture of the perfect couple - it often looks like two beings twisted into one. I see that, I feel that, I love that - but it’s a delusion. Look at love as two souls choosing to walk side by side, feeding themselves first and then delivering their own delights to the other. In those moments of solitude, we often find appreciation hiding there. Growing up doesn't mean growing apart. We are constantly evolving creatures. Each day we have the opportunity to wake up and choose who we want to be. Let your partner grow into the person they are meant to be so you can do the same. Consistency can still thrive amidst change. Relationships are about keeping it real. They are about recognizing that going through growing pains make the reward all the sweeter. Love is about looking inward at your progress and outward with honesty. It is about realizing that you aren’t alone in the low moments and refusing to compare those lows to other people’s highs. Love is an enigma. Love is growing something so much greater than just one person could be. You know that whole, “love is patient, love is kind” crap? Yeah, it’s that. Want more stories like this? Hit me with the subscribe.